Since the introduction of the lion symbolism from Indian culture especially through Buddhist symbolism, statues of guardian lions have traditionally stood in front of Chinese Imperial palaces, Imperial tombs, government offices, temples, and the homes of government officials and the wealthy, from the Han Dynasty (206 BC-AD 220), and were believed to have powerful mythic protective benefits. They are also used in other artistic contexts, for example on door-knockers, and in pottery. 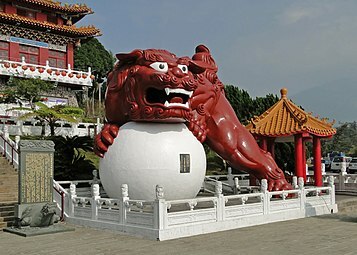 Pairs of guardian lion statues are still common decorative and symbolic elements at the entrances to restaurants, hotels, supermarkets and other structures, with one sitting on each side of the entrance, in China and in other places around the world where the Chinese people have immigrated and settled, especially in local Chinatowns. Buddha’s or Buddhist lion: referring in a religious context to the lion as protector of Buddha. The lions are traditionally carved from decorative stone, such as marble and granite or cast in bronze or iron. 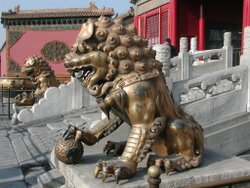 Because of the high cost of these materials and the labor required to produce them, private use of guardian lions was traditionally reserved for wealthy or elite families. Indeed, a traditional symbol of a family’s wealth or social status was the placement of guardian lions in front of the family home. However, in modern times less expensive lions, mass-produced in concrete and resin, have become available and their use is therefore no longer restricted to the elite. The lions are always presented in pairs, a manifestation of yin and yang, the female representing yin and the male yang. The male lion has its right front paw on a type of cloth ball simply called an “embroidered ball” (xiù qiú, 绣球), which is sometimes carved with a geometric pattern (coincidentally, resembling the figure called “Flower of Life” in the New Age movement). The female is essentially identical, but has a cub under the closer (left) paw to the male, representing the cycle of life. Symbolically, the female fu lion protects those dwelling inside (the living soul within ), while the male guards the structure ( the external material elements ) . Sometimes the female has her mouth closed, and the male open. This symbolizes the enunciation of the sacred word “om”. However, Japanese adaptations state that the male is inhaling, representing life, while the female exhales, representing death. Other styles have both lions with a single large pearl in each of their partially opened mouths. The pearl is carved so that it can roll about in the lion’s mouth but sized just large enough so that it can never be removed. Chinese lions are intended to reflect the emotion of the animal as opposed to the reality of the lion. This is in distinct opposition to the traditional English lion which is a lifelike depiction of the animal. The claws, teeth and eyes of the Chinese lion represent power. Few if any muscles are visible in the Chinese lion whereas the English lion shows its power through its life like characteristics rather than through stylized representation. Lioness and cubs from the Yuan Dynasty discovered inside Beijing‘s city walls. Asiatic lions were once quite common throughout their historic range in Southwest, South and Central Asia and are believed to be the ones depicted by the guardian lions in Chinese culture. In India where the Asiatic lion also lived it is know by its ancient Sanskrit name “Sinh” or “Simha” (सिंह) and due to travels of Buddhist monks many East Asian languages have borrowed from this Sanskrit word for lion. Since ancient times Lion statues adorned palaces and temples and other important buildings in India and in Buddhist culture Lion was depicted as the protector of Dharma. In Hinduism lions are associated with Gods and Goddesses. With increased trade during the Han dynasty and cultural exchanges through the Silk road, lions were introduced into China from the ancient states of Central Asia by peoples of Sogdiana, Samarkand, and the Yuezhi (月氏) in the form of pelts and live tribute, along with stories about them from Buddhist priests and travelers of the time. This exchange can be seen in that the Chinese word for lion is “Shi” (師, later 獅/狮), which shares the same etymological roots as “Shiar” (شیر), the Persian language name for the animal. Several instances of lions as imperial tributes from Central Asia were recorded in the document Book of the Later Han (後漢書) written from 25-220 CE. On one particular event, on the eleventh lunar month of 87 CE, “… an envoy from Parthia offered as tribute a lion and an ostrich” to the Han court. Indeed, the lion was associated by the Han Chinese to earlier venerated creatures of the ancient Chinese, most notably by the monk Huilin (慧琳) who stated that “the mythic suan-ni (狻猊) is actually the lion, coming from the Western Regions” (狻猊即狮子也，出西域). The Buddhist version of the Lion was originally introduced to Han China as the protector of dharma and these lions have been found in religious art as early as 208 BC. Gradually they were incorporated as guardians of the Chinese Imperial dharm. Lions seemed appropriately regal beasts to guard the emperor’s gates and have been used as such since. 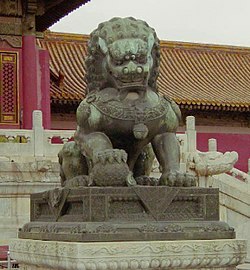 There are various styles of guardian lions reflecting influences from different time periods, imperial dynasties, and regions of China. These styles vary in their artistic detail and adornment as well as in the depiction of the lions from fierce to serene.